The other day I was laying comatose on the couch when Battledogs came on the tube, on Syfy. My migraine had subsided enough where I could actually look at and listen to things, so the movie aired. 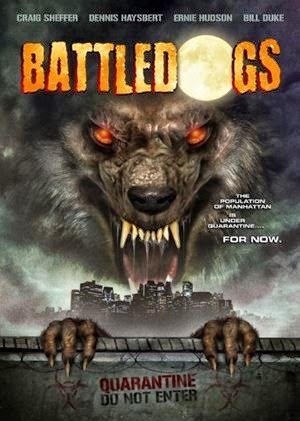 Battledogs is a 2013 TV movie from The Asylum, and I'm not sure if this was a knock off or not. Some suggest it mocks World War Z, but I'm not sure.. maybe. But the story seemed decent enough to merit a quickie write up from Cinema Static. The cast includes Dennis Haysbert (The Unit, 24), Ariana Richards (Jurassic Park, Tremors), Kate Vernon (Battlestar Galactica), Ernie Hudson (Ghostbusters), Craig Sheffer, Bill Duke (Predator) and Wes Studi (Avatar, Last of the Mohicans). 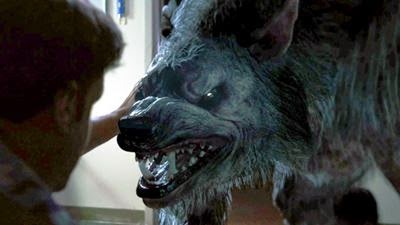 In Battledogs, a werewolf virus is unleashed in New York by an unwitting victim/werewolf. She's at the center of a public outbreak of quick changing werewolves in a major airport, and a specially trained unit of the military responds to contain the situation. This starts the story of three different focuses. A small group of folks looking to help cure the outbreak while the military is looking to contain and weaponize this potential tool. It's a battle back and forth, between the small force of folks looking to do the right thing and the larger, well organized government forces trying to steal or obtain the source of the cure or the source of the virus. Yes, this is an Asylum production and Syfy network flick. Yes, it's the standard fare of effects most fans have come to expect from the movies we see on Syfy. But the story actually had some meaningful context between the opposing groups and that kept the movie interesting enough to keep an eye on it while airing. It's almost like a video game with iffy visuals but great tactical play. To be honest, the name actors in the movie seem to have their hands tied in how they present their characters because I've seen better out of all of them, but they at least lend some credence to the movie. And there are a few minor aspects that give it a little independent character. Admittedly, do not compare it to a quality flick. That will destroy your opinion of it. And it has the usual amount of crap coordination of scenes being filmed with logical character action. (IE: Why, in a line of soldiers, would only 2 have shields?) Nor would I go out of my way to see Battledogs if I saw it on the schedule, but if it came up, I'd say you don't have to change the channel. You might find yourself slightly entertained by the tale it tells. If anything, it's pretty entertaining in the middle of the night and easily outranks any late night infomercial you might catch on other networks for Cialis, or what not.